Vista upgrades NTFS to include some shiny new features, one is Transactional NTFS or "TxF". That means there's a Resource Manager for NTFS so you can batch up a whole transaction worth of file writes and if any of them go wrong - rollback. I'm having a little trouble with Transactional NTFS right now because the resource manager is shutting down because I need to run chkdsk /f on my drive and I can't, but that's a story for another day. Philip left a comment in my recent post on improvements in junctions/reparse points/symbolic links in Vista. He said "Have you tried using the new Vista symbolic directory link support available in the command line program "mklink /d". I have successfully used it cross-drive for other directories,though I haven't tested it in your scenario." Soinks! That's what I get for not keeping up with Junfeng Zhang's excellent blog. Postulate: Symlink is to Junction in Windows as Symlink is to Hardlink in Unix. Symlinks can span volumes (wicked useful) and you can also Symlink to UNC paths. Woof. Notice the Command Prompt Screenshot at Right. In this example "My Documents" is a Symlink to another drive, while Junction points locally. I am still a little unclear about the difference. As I understand it, junctions are "reparse points" and support links to local files and directories while symlinks are built into the NTFS file system at the Kernel level and support spanning drives. Perhaps Mark Russinovich will jump in here and explain. Here's my DOS prompt removing my non-working junction and using the new MKLINK to get My Documents onto another drive. C:\Users\Scott>mklink /d "My Documents" "d:\Scott\My Documents"
10/02/2006 09:42 PM <DIR> . 10/02/2006 09:42 PM <DIR> .. Turns out I was (half) wrong when I said that Explorer doesn't know about Junctions. It knows enough about Junctions to show the shortcut icon, but that's about it. 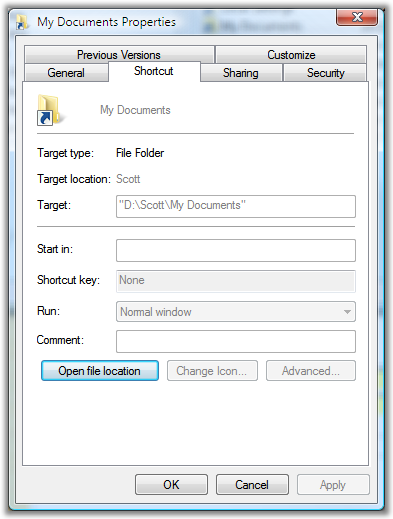 However, Explorer DOES know enough about Symlinks to show the Target (pointed to) directory in the Properties dialog. Nice. Junctions are based on reparse points (a more general technology) and do support linking to a directory in another drive. Junctions only work on directories though. Symbolic link in NTFS is same as symbolic link in UNIX. Hard link in NTFS is same as hard link in UNIX. Junction is similar to symbol links for directories only. Symbolic links are the only links that work on both files and directories. A junction appears to be much tighter binding than that of a directory symbolic link. Based on reading, operations on the junction transparently treat it as the target directory itself. This has several implications. So deleting a junction will affect the target directory. But deleting a symbolic link just deletes the link itself. The access controls on UNIX symbolic link itself is ignored; only the target is relevant. But those on both the source and target of a junction are important. The size reported by a symbolic link is actually the same as the number of characters in the path to which it points to, as if the symbolic link is a file with the name of the destination path stored in it. Yeah, but you mention only half of the equation with TxF. Yes, you can batch up a bunch of writes. However, since the new components also communicate with MSDTC, you can have the transaction encapsulating the file writes also contain SQL Statements or any other capabilities that you have a Resource Manager for. So, I can open a TransactionScope, execute a SQL Statement and write a file, and if either fails, they both get rolled back. in your powertools page the powershell link is broken. Scott, I don't understand why you have not been able to get junctions to work on another drive. I have about 5 junctions on my C drive pointing to my D drive. This would seem to be stranger still, since junctions are important part of Active Directory. I am guessing that the tool you use "junction.exe" doesn't cross volumes. However, if you use linkd.exe, you can create a junction to a different drive. Junctions are more like symbolic links, because they refer to a path that may not exist and could be in a different drive. Ya, I'm thinking my troubles have more to do with junction.exe than Vista. It is quite possible that Junction.exe may not recognise symlinks created using the /D switch after all it was made in the 2000/XP days. I cannot understand why under Explorer the original/older folders appear to have the Vista name & icon of "Music" & "Pictures" when in fact they are still iMAGES & MUSiK when I list them using the DIR command. I've scratched my head for too long thinking maybe it's some undocumented MKLINK magic. But here's where it get's even more strange. I still see a "Pictures" & a "Music" in my user folder (which point to my older folders by the way, as expected) but they JUST DON'T SHOW UP in a DIR listing!!! I tried everything like the /ADHSL switch but "Pictures" and "Music" are nowhere to be found. This is great information, however it makes it very difficult to do a CLONE with something like XXCOPY, since junctions & symlinks just repoint to the original files. XXCopy ends up copying these twice.